Looking for a "last lesson before Christmas" activity to use with your adult or teenage students? Try a Christmas quiz. Here are some questions which you could use from intermediate level up, with the answers below. To find out the background to the answers, just Google the key words - eg for question one - Christmas illegal Massachusetts. Or even better, get your learners to do it. If they've got smartphones with them, each learner can find out the background to one of the questions and then present it to the others. 1. Where was it once illegal to celebrate Christmas? 2. Since when has Christmas been celebrated on 25th December? 3. The historical figure who inspired the Santa Claus myth is St. Nicholas. Where was he born? 4. When were electric lights first used to decorate a Christmas tree? 5. Who was the first British monarch to have a Christmas tree? 6. Which spacecraft was lost on Christmas Day 2003? 7. What did Harry Potter get for Christmas the first year he was at Hogwarts School? 8. The Romans also had a mid-winter festival around the same time as Christmas is now celebrated. What was it called? 9. 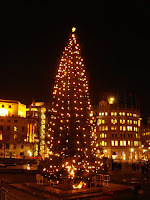 Every year another nation gives a Christmas tree, which is placed in Trafalgar Square in London, to Britain. Which nation? 10. Who was the author of the novel A Christmas Carol, in which a miserly old man called Scrooge is visited by the ghosts of Christmas? 11. Where does Father Christmas live? 12. Which of the following is not the name of one of Father Christmas' reindeer?